We have the exercises for knee arthritis to suit your needs, whatever the severity of your arthritis. Strengthening your knee will help reduce pain and keep you moving. We have some bad news and some good news. The bad news is that there is no cure for osteoarthritis to date and exercises for knee arthritis do not seem to reverse knee cartilage deterioration1-2. While that’s probably not what you wanted to hear, the good news is that they can offer significant increases in strength, range of motion and pain reduction for those suffering from osteoarthritis irrespective of the severity or stage of the disease. They do this by helping reduce the impact of secondary symptoms (e.g muscle weakness and balance issues) which are present in most cases of moderate to severe osteoarthritis. Secondary symptoms are usually the result of chronic pain giving way to the adoption of a more sedentary lifestyle. Less activity, exercise and overall stimulation for the muscles that support your knee causes the musculature to atrophy making the joint even less stable. Further compounding this situation is the fact that after the age of 50, most of us will begin to lose 0.5-1.0% of our body’s muscle mass per year3. Some of dubbed this a “vicious cycle” as less physical activity may cause more pain and dysfunction which in turn may motivate even less physical activity. The best way to conceptualize exercise and your arthritic knee is to understand that while it may not be a cure, it will significantly and dramatically slow down the progression of the disease – offering you a higher quality of life. What Type of Exercises for Knee Arthritis are Best? The International Osteoarthritis Research Institute (OSARI), American Academy of Orthopedic Surgeons(AAOS), American College of Radiology (ACR) and the European League Against Rheumatism (EULAR) all recommend exercise along with weight reduction as the top conservative treatments for arthritis in the knee4. While it is widely recognized that exercise plays a vital role in reducing the pain and discomfort that comes with arthritis, it can be confusing what type of specific exercise programs will work best for you. In fact even scientists are unsure, as the latest research offers little guidance as to specifically what mode, dosage and frequency of exercise is best5. Exercises for knee arthritis are generally broken down into three categories: mind and body, aerobic and strength exercise. While all of these have been shown be effective in reducing pain and disability associated with osteoarthritis – they don’t work for everyone6-8. You may have to go through a trial and error process to figure out what type of exercise and workout frequency will give you the best results. There is no one size fits all prescription. 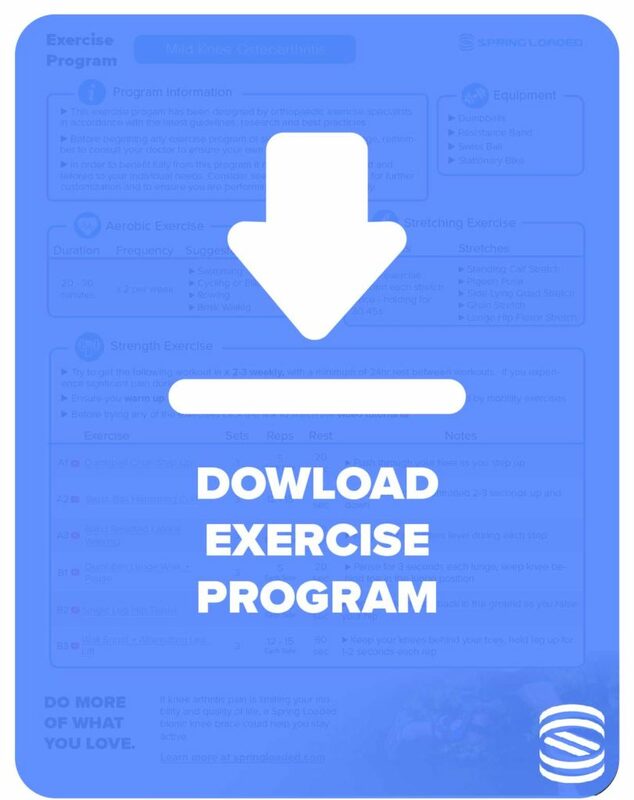 Guidelines and research differ but generally suggest the following ranges for dosage and intensities for the three modes of exercises. Mind & Body 2-3 times per week for 30-45 minutes6. Aerobic Exercise: Three times per week at 50-70% of your maximum heart rate for approximately 30 minutes each session7. Reduce pain, dysfunction and increase your quality of life. You will likely have to experiment to some degree to find what works for you. In the preceding section you’ll find three exercise routines that are generally appropriate for knee osteoarthritis of different severities. Read the description of the symptoms and decide which aligns most with your situation. Be sure to consult a health professional before considering any significant lifestyle change such as this. Remember to monitor your symptoms before, during and after, particularly when you are just starting out. While you may experience muscle soreness (a good thing!) you do not want increase inflammation and undue stress on the cartilage in the knee joint itself. If your knees are constantly feeling worse after exercise they may be too advanced or you may not be doing them properly. In either case the best course of action is to consult your doctor or physiotherapist to obtain guidance that is more specific to your situation. You live an active lifestyle but suffer occasionally from symptoms related to knee arthritis. After performing high impact activities you consistently experience knee pain and stiffness the next day although it always resolves with rest or over the counter pain medications. Walking and stair-climbing typically do not cause any pain or discomfort. You don’t have a prescription for pain-killing drugs. You are constantly experiencing knee pain and your doctor has informed you that you have chronic arthritis in your knee joint. After being on your feet all day your knees often feel very painful and stiff. When you walk up stairs you feels uncomfortable and off-balance often using the railing for assistance. You frequently take non-prescription painkillers to manage your symptoms. Walking for 20 minutes on a flat surface is generally comfortable, however hilly or uneven terrain causes your knees to flare up. You’ve been diagnosed with severe arthritis and have discussed surgical interventions with your doctor. Weight bearing movements cause your knee to become extremely painful. Walking can be painful and you make use of a cane to help off-load your injured knee. You have a prescription for pain killing drugs that you use often to resolve your knee pain. Many of us start home based exercise programs with best intentions but often our motivation just seems to fizzle out. As a result we end up exercising much less consistently than we know we should. A simple way around this is to introduce some social accountability by participating in a group exercise class. Both Yoga and Tai Chi while not specifically aimed at improving knee function have both been shown by to provide lesser but significant improvements in osteoarthritis related symptoms compared to more traditional home based exercise programs10. Group ‘Aquasize’ and ‘Spin’ classes are other popular alternatives. Remember exercises for knee arthritis are most effective when sustained over a long period of time as part of a lifestyle. If exercise just isn’t for you or you are struggling to find a routine that works, an unloader knee brace may be worth considering. This type of brace can reduce the stress on your knee joints allowing you to do more without provoking your symptoms. Less pain means you are able to do things you love and maintain a high quality of life. Hunter, D. J., Beavers, D. P., Eckstein, F., Guermazi, A., Loeser, R. F., Nicklas, B. J., … & Legault, C. (2015). The Intensive Diet and Exercise for Arthritis (IDEA) trial: 18-month radiographic and MRI outcomes. Osteoarthritis and cartilage, 23(7), 1090-1098. Phillips, S. M. (2015). Nutritional supplements in support of resistance exercise to counter age-related sarcopenia. Advances in Nutrition, 6(4), 452-460. Fransen, M., & McConnell, S. (2008). Exercise for osteoarthritis of the knee. Cochrane database of systematic reviews, (4). Bartholdy, C., Warming, S., Nielsen, S. M., Christensen, R., & Henriksen, M. (2017). Replicability of recommended exercise interventions for knee osteoarthritis: a descriptive systematic review of current clinical guidelines. Brosseau, L., Taki, J., Desjardins, B., Thevenot, O., Fransen, M., Wells, G. A., … & Gifford, W. (2017). The Ottawa panel clinical practice guidelines for the management of knee osteoarthritis. 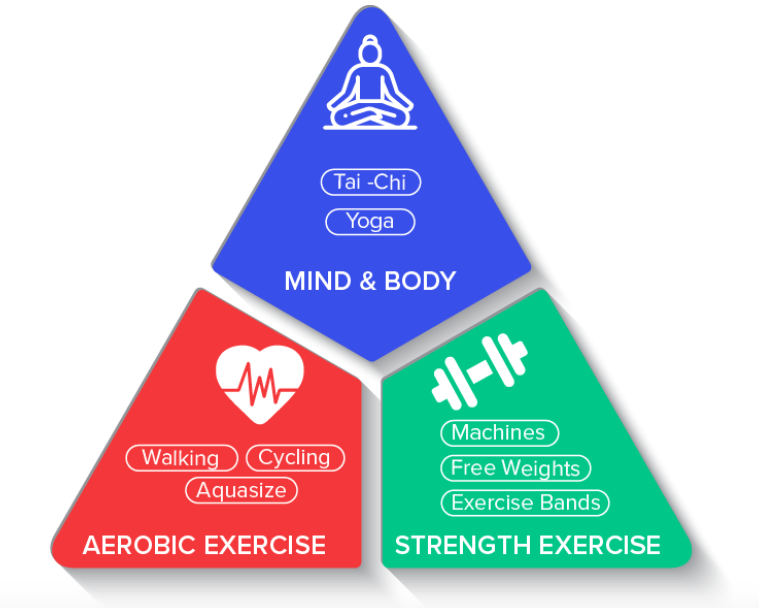 Part one: introduction, and mind-body exercise programs. Clinical rehabilitation, 31(5), 582-595. Brosseau, L., Taki, J., Desjardins, B., Thevenot, O., Fransen, M., Wells, G. A., … & Gifford, W. (2017). The Ottawa panel clinical practice guidelines for the management of knee osteoarthritis. Part two: strengthening exercise programs. Clinical rehabilitation, 31(5), 596-611. Brosseau, L., Taki, J., Desjardins, B., Thevenot, O., Fransen, M., Wells, G. A., … & Gifford, W. (2017). The Ottawa panel clinical practice guidelines for the management of knee osteoarthritis. Part three: aerobic exercise programs. Clinical rehabilitation, 31(5), 612-624. Wellsandt, E., & Golightly, Y. (2018). Exercise in the management of knee and hip osteoarthritis. Current opinion in rheumatology, 30(2), 151-159.